This cute valentine image is perfect for February. I was stamping with my sister and she grabbed a big handful of pink markers while I went a different route. I had come across of sheet of Bazzill chip toppers for years gone by that were languishing in my stash. This one had a love theme. (Usually in February I find my Halloween stash and the V-day remnants show up in July) This time however, timing was on my side. My markers weren’t quite as cooperative. While I had some decent matches, I happened to be a bit thin in blending groups for those colors. Pretty much single markers but that’s okay. I just made do. After she was colored, I assembled a card. I’m working out of satchel so my choices were limited. White cardstock ruled the day. 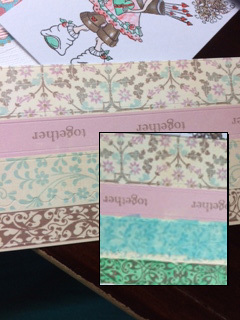 I had a spellbinders white die cut that I colored to match. Edged the image and card with a brown marker. Recolored my metal heart brad Colored some MME stickers that have been sitting around for eons. (The brown sticker was great but I didn’t want the deep cream background with my crisp white cardstock. I used my same bg marker on it and it was lovely but a bit too green. Taking a cue from that experiment I used b01 on the second cream backed sticker and it came a little closer. As I started laying out my stickers, I didn’t have a lot of room for the MME but I did need a little something at the bottom. I hand cut two hearts from the newly colored sticker using the scallop in the sticker for the curved part of the hearts (which I would have butchered otherwise). I joined them with a cut up chip topper. My top sticker was far too much on the blue side of bg so a quick touch up with bg34 brought it back into the fold. I thought it would be fun to add a metal conversation heart brad to her hair band but it was a little blue as well. Six seconds later, we had a match. I added a piece of doily and then just needed a little bling. I had my small Mark Richard’s pearls with me, so i pulled out my markers and colored them up. This entry was posted in Uncategorized on February 11, 2014 by twyladavis.